- Register to keep getting your magazine FREE here. - Cause for celebration? 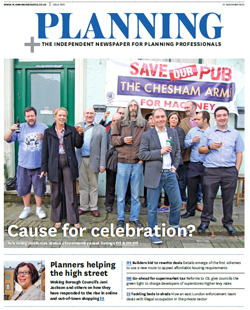 Pub ruling reinforces status of community asset listings. - Planners helping the high street: Woking Borough Council's Jeni Jackson and others on how they have responded to the rise in online and out-of-town shopping. - How We Did It: How an East London enforcement team deals with illegal occupation in the private sector. - Plus, Alex Morton, "The idea that we need more planning control to improve design quality is simply wrong". Will the development corporation model deliver at Old Oak Common? A port expansion in Essex has secured approval after green belt, heritage and ecological concerns were resolved, says Colin Marrs.